The goddess Matsu is one of the most important deities in Taiwan. It’s a simple equation, really: Goddess of the Sea + Taiwan being an island = high status among worshippers. Matsu was already important among the coastal Fujianese before crossing the straight, but the perilous journey from the mainland to Taiwan required a lot of prayers to the being in charge of the waves. 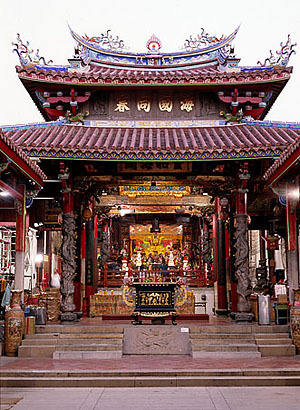 There are estimates of over 400 or 500 Matsu temples in Taiwan, but one of the most sacred is right in downtown Tainan. Tainan Grand Matsu Temple (Dà Tiānhòu Gōng) was a palace before it was a temple. Zheng Chenggong’s (Koxinga’s) son, Zheng Jing, had it built for The Prince of Ningjing (Zhu Shugui) after inviting the Ming prince to take up residency in Taiwan. The palace was where the prince was living when he decided to take his own life, and it was in the main hall of this building that his five concubines hanged themselves from a wood beam. When the Qing took over Taiwan, General Shi Lang took up residency in the palace. Later, in a political move, he petitioned his emperor to have the building converted into a temple dedicated to Matsu. 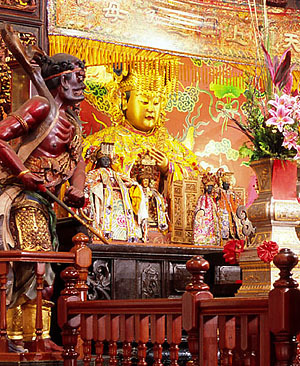 The Grand Matsu Temple of Tainan was the first officially dedicated Matsu temple in Taiwan. It gains additional esteem because around the time of its dedication the diety Matsu was elevated in status, and so this temple was the first to be named Tiānhòu (Heavenly Goddess) as opposed to Tiānfēi (Heavenly Princess). From its initial inception as a palace in 1664 up to now, the building has gone through ups and downs and several renovations. In 1683, General Shi Lang altered it to his liking and then had it converted into a temple as stated above. It went under major renovations in 1765 and then more restorations in 1775 that give the temple its current appearance. It was renovated again after a fire in 1818. Near the end of the Qing dynasty, when the economy was in decline, the building fell into disrepair. During the Japanese occupation the building was nearly auctioned off to private investors, but was saved at the last minute. It was affected by an earthquake in 1946. In 1985, The Grand Matsu Temple became listed as a first-class national historic site. This is one of the largest temples in Tainan City, especially among the old historic ones. There are many rooms dedicated to various deities in back of the main hall. The main hall itself has a wide variety of deities. Unmistakably, the large golden one in the middle is a representation of Matsu. The two tall monster-like statues on either side are Matsu’s servants, Qianli Yuan and Xufong Er. Legend has it that these two creatures were monsters that Mastu subdued and converted to do good, helping her to patrol the seas and help sailors. Other rooms are dedicated to a variety of other deities, both water-related and otherwise. One of the rooms is the Sacred Parents Hall. This room is on the original placement of the Prince of Ningjing’s bedroom and houses diety statues for the prince himself, as well as Matsu’s parents. The temple has a several-page brochure in English with full descriptions of the deities. The temple is located in the Chikan Lou Cultural Zone, but it’s not easily visible. 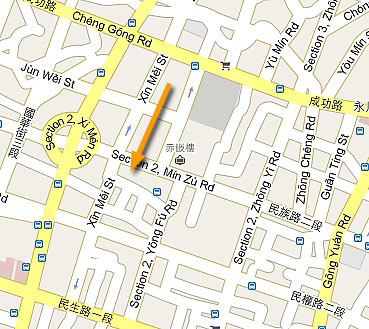 It’s tucked behind some buildings that run along the south side of Minzu Road between Yongfu and Ximen. Just poke around the alleys and you’ll find it. Or just down the alley that’s to the left of the entrance to the Official God of War Temple. Great article on a wonderful temple. Two things: there used to be a great outdoor sushi restaurant right next door, is it still there? Also, have you thought about doing a post on the Matsu “mother temple” in Luerhmen, the dang-git, etc.? The big outdoor sushi restaurant on Minzu is still there. It’s quite popular and famous among locals and tourists. I was impressed by it the one time I ate there, but I should give it a second chance sometime. Good suggestions on posts. I have no shortage of plans for posts, just a limitation in time to work on them. I think that the real story of Mazu is amazing!